What started as a one-off event refused to cease and end in the traditional sense. The creativity and energy that surrounded Project ’67 would grow and become what is now the Project Arts Centre. 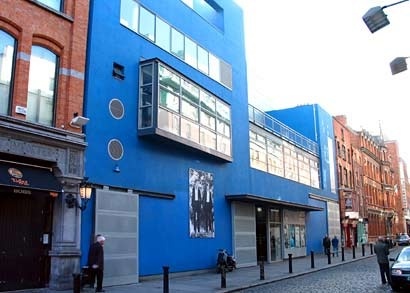 For almost half a century, the Project Arts Centre has stood as a loud, true and independent voice in the Irish theatre and visual arts scene. Today, its archive spanning 35 years has been deposited and catalogued at the National Library of Ireland. The Project Arts Centre was initially created as a temporary and singular artistic event in the form of a three-week festival at the Gate Theatre, known as ‘Project 67’. The festival included plays, readings, jazz, teach-ins on censorship and theatre and art exhibitions. The presence of the Project archive creates a living memory bank and artistic resource possibly umatched in Irish artistic and theatrical history. It contains detailed manuscript records of the theatre, dance, visual art, film and music that made the Project synonymous with new and emerging Irish talent. The archive is a comprehensive account of the initiation and gestation of the Project, and traces its growth, its leaders, its greatest theatrical and artistic events, its many homes and also its conflicts. The first task I had in tackling this volume of records was establishing a system to break down the records into series and subseries. In this case, the records were structured under the main series of Visual Arts, Theatre, Board of Directors, Finance, Administration, Buildings and Premises. A few other series accommodated outlying records. There is no shortcut for arranging and structuring an archive collection: every page, letter, photograph, poster, program and contract must be identified, listed and organized under its appropriate series or sub-series until a file by file listing can be established. Papers went into acid free folders and boxes, photographs and slides into mylar plastic, outsize posters into specialized cabinets. Throughout the process I tried to consider how the collection might be accessed and utilized. Here, previous experience as a reader researching theatre collections was a benefit to understanding the processes of structuring and navigating a complex and large archive collection. The Project earned a reputation as being a venue that produced new and emerging artists and their interaction with the centre can be examined through the archive. For example, a near compete set of minutes of the Board of Directors of the Project Arts Centre details the decision making process that drove the Project, the artists it nurtured and the vast body of work they produced. The role the Irish government played in promoting the growth of arts in Ireland is also clearly evident in the Project archive. The years of the 1970’s and 1980’s would be key in the emergence of an internationally recognized Irish arts scene. The Project archive is a key resource for social and political historians of this crucial period in Irish History. For example MS 46,085/1 is a press cutting showing the attendance of Charles Haughey (then Minister for Finance) at the opening of the Project Gallery in Lower Abbey Street in 1969. Urban historians will also be interested in the Project’s role in the redevelopment of Templebar during the 1990s. This is documented in architectural plans, drawings and correspondence surrounding the new Project Arts Centre premises (MS 46,253/1-9). The Irish Times (Weekend, 3 Apr 2010) recently noted how Project Arts Centre celebrated the past, the present and the future, as it launched its new Friends fundraising scheme. Peter Sheridan’s speech reminded a young audience of Project’s history and legacy as “a vital socio-political force” in the late 1960s and early 1970s. Today, through its archive, the Project past is available to all. Any arts centre can give no more to the future than to give the essence of its past. This collection raises and challenges the question of how ‘performance’ can be preserved and archived. The idea of the energy of the living artistic space and the audience translated or even recreated through an archive has been debated for many years. While that debate rages on, the Project archive has been rescued from historical deletion and takes its place within the narrative of Irish artistic and cultural history. Barry Houlihan is an archivist and theatre lover. His has a history and culture blog, Staged Reaction. This entry was posted on 12 May 2010 at 08:00 and is filed under Archives. You can follow any responses to this entry through the RSS 2.0 feed. You can leave a response, or trackback from your own site.